J.Crew Chambray Shirt, NN.07 Loopback Sweatshirt. All at Mr Porter. AMI Striped Trousers at Mr Porter, Valentino Printed Trousers at SSENSE. Prints are everywhere this season. From shirts to backpacks, hats, blazers and even suits it's pretty much impossible to escape them. I, for one, am a bit fan of prints in general, though I will admit I rarely dare to wear them. It took me a while to wrap my head around camo so once I did I felt like the edgiest person ever. This season I'm considering the printed trouser, which is perhaps the one that requires the most guts. Whereas it's a bold colour accompanying a classic print or an out-there print in a classic colour, you need to make sure you wear them the right way. By pairing printed trousers with classic cuts in subtle colours you allow the print to stand out while toning it down – bringing an outlandish element into your comfort zone. 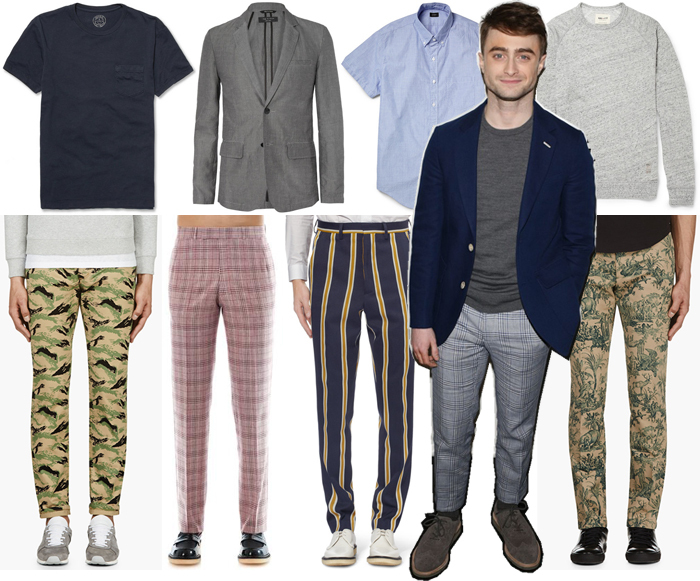 I have chosen some of my favourite printed trousers this season and some of the classic pieces they should be worn with to follow Daniel Radcliffe's perfect example of how prints should be worn.